Inherited Bloodline Limits can be activated through your Backpack window. A new Bloodline Limit icon will appear in your character's portrait. Click to open the Bloodline Limit Window similar to the screenshot below. 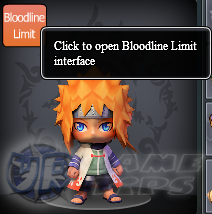 - Bloodline Limits must also be activated first before it's attributes takes effect! - Choose up to 3 Bloodline Limit. 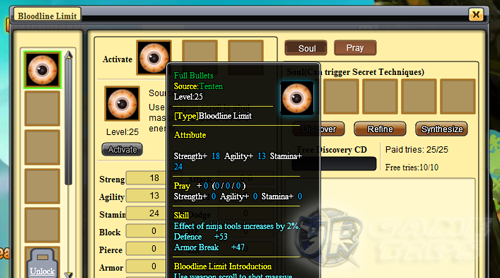 - Bloodline Limit can enhance player's ability via Bloodsoul's Soulbound. to inherit the Bloodline Limit after forgetting. - Click on Soul button to start discovering! - Bloodsoul will enhance your power after bound to the Bloodline Limit. - There's a level restriction for binding Bloodsoul. - You can discover Bloodsoul for free several times a day. - You can also choose to discover using Discover Talisman or Gold. - The interface will just show 3 slots for Bloodsouls but you can actually discover more! - Discover has CD (Cooldown) time. - Click on the Bloodsoul and select Soulbound to bound it to your Bloodline Limit. - Warning! bound Bloodsouls can't be taken back unless you have Soulsplit Blade! - You can also get Bloodsouls at the Ninja Trial. - Bloodsoul can be removed after being bound by using Soulsplit Blade to take it back. - On the other hand, Bloodsouls will disappear after being cleared! - There are various types of Bloodsoul with different attributes. - Bloodsoul can be converted to another type after refining. Bloodsoul that is different from the other two, a random Bloodsoul will be synthesized. - Bloodsoul has 7 levels. Higher level has higher requirement for Bloodline Limit. - Pray will enhance attributes. Click on Pray button to start. - Select and put the Bloodsoul in the slot for Pray. - Different types of Bloodsoul can be used to pray for specific attribute. - Warning! The Bloodsoul used will disappear after clicking the Pray button! - Click on Pray to begin the process. - Fill the Pray EXP bar to finish the process. 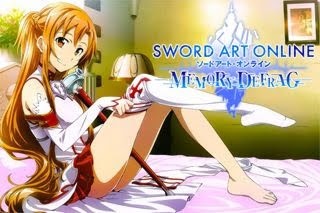 - Pray EXP will increase according to the Bloodsoul used for praying. attributes. Warning! The EXP bar will empty out if you selected a new attribute! - Every Bloodline Limit has a level cap for Pray.